Our own Andrew Reiner went to buy the game this morning, and he was told by the clerk that it had been recalled. He headed to another store, and the case did indeed contain the demo disc. The clerk there then opened the cases for the entire shipment and they were all the same. 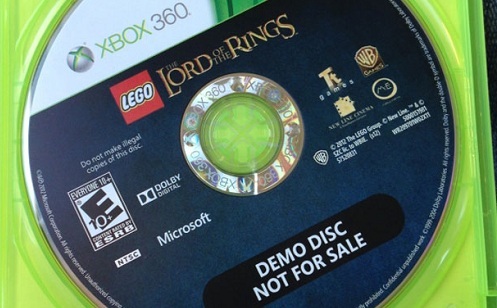 All of this begs the question: How in the hell did frickin' Game Informer not receive a review copy of LEGO Lord of the Rings? They're like, the number one game informing magazine on the planet, and as far as we know, the universe. Interesting side note: Andrew Reiner also happens to be in possession of the handsomest first name. But seriously. Open up that noise at the store. The glitch in the system should have only affected a few shipments of Xbox 360 discs. Gas in expensive. And no one wants to talk to Game Stop employees more than they have to. I'm just kidding. I love you guys. LEGO Lord of the Rings supports two player local co-op. Today it's available on the Xbox 360, PlayStation 3, PC, and Wii.